Tourism authorities call Mexico Beach, Fla., “the Unforgettable Coast.” That’s even more true now after haunting images show the seaside town turned to splinters by Hurricane Michael. From his home nearly 600 miles away in North Miami Beach, architect and engineering consultant Ricardo Alvarez spent much of last Thursday and Friday comparing storm photos and Google satellite images of the destroyed town of 1,200 residents, which some have speculated will never be rebuilt. Alvarez wasn’t focused on the splintered houses and denuded concrete slabs that account for what he believes to be 80 percent of Mexico Beach’s seaside homes and businesses. He was focused on the buildings that stayed standing after nature’s version of an atomic bomb exploded over Mexico Beach. “This was comparable to Andrew, there’s no question,” Alvarez said, referring to the 1992 Category 5 storm that destroyed more than 63,000 homes in South Florida. On Friday, real estate analytics firm CoreLogic Inc. said insured losses to residential and commercial properties from Michael would amount to between $3 billion and $5 billion, including claims under the National Flood Insurance Program. Karen Clark & Co., a national catastrophe modeling firm, estimated that privately insured losses to residential, commercial and industrial properties and automobiles could reach $8 billion. Category 4 and 5 hurricanes—while excruciating and costly—also provide important opportunities for experts to measure how state and local laws that govern development, including building codes, have kept up with changes in hurricane behavior. Alvarez, the founder and president of Mitigat.com Inc., a Miami-based vulnerability assessment and mitigation firm, has studied every Florida hurricane since Andrew with hopes of pushing governments and the private sector to do a better job of siting, planning, designing, engineering and building structures in hurricane zones. He was also instrumental in helping draft what is now the Florida Building Code, one of the nation’s strongest standards for coastal zone development. For example, reports of the badly damaged Bay Medical Sacred Heart in Panama City revealed that the hospital sustained roof, structural and water damage during the hurricane. Alvarez, who has consulted with a number of Florida hospitals on hurricane-proofing measures, said he was struck by the large amount of broken glass around the hospital building. “It tells me the windows were not impact-resistant, which is one of the most basic things we tell owners of buildings they need to do,” he said. Older homes, which account for a substantial percentage of the housing stock in the eastern Panhandle, also proved to be especially vulnerable to Michael’s 8-to-10-foot storm surge and 155-mph winds. Air Worldwide, a risk modeling firm, said property damage from Michael will be inflated because most buildings in the Panhandle were built before 1995, when less stringent building codes were in place. Air found that most structures are designed to withstand gusts of between 120 and 140 mph. Michael came ashore with sustained wind speeds of 155 mph and gusts of up to 175 mph. The firm also noted that many older buildings did not have “hurricane shutters,” resulting in a higher level of damage from flying debris. Requirements for hurricane shutters were introduced with the 2001 Florida Building Code. Panhandle properties that are rebuilt post-Michael will have to meet the stronger standards, but experts say homeowners who have upgraded their homes since the 2004 hurricane season—when four major storms struck the state—should be mindful that hurricanes are becoming more powerful and more destructive due to climate change. 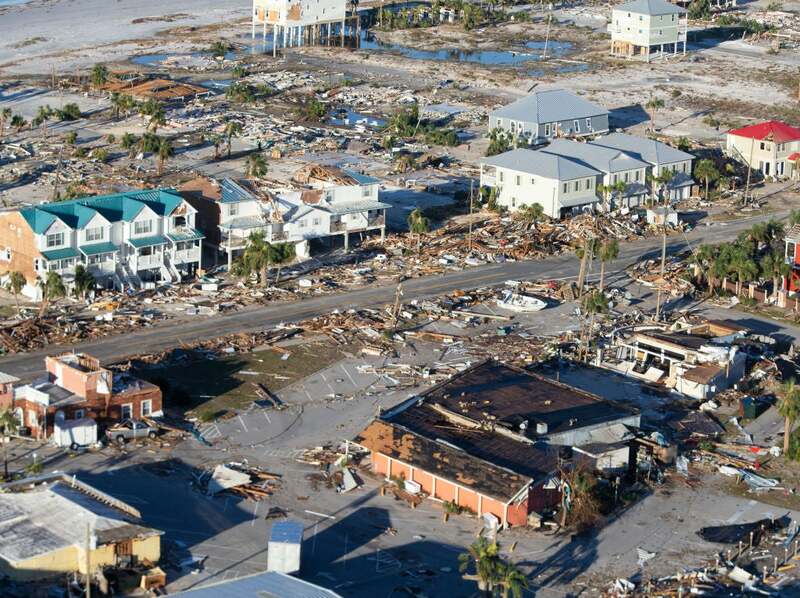 On Friday, Mexico Beach Mayor Al Cathey said he’s confident the city will be rebuilt, but to a higher standard than before Michael came ashore.